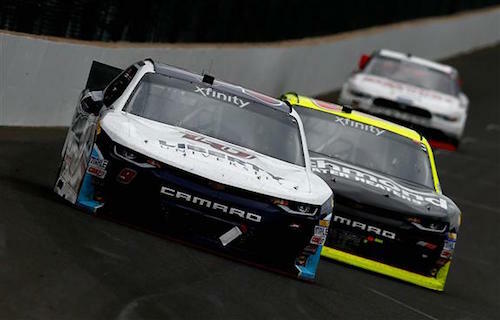 NASCAR is transitioning its Xfinity Series competitors to composite bodies. Teams in the series will have the option to use the bodies for upcoming races at Richmond (Va.) Raceway, Dover (Del.) International Speedway and Phoenix International Raceway in 2017 and in all races, except superspeedway races in 2018. They’re expected to become mandatory in 2019. The flange-fit composite body will consist of 13 separate panels and will be provided by Five Star RaceCar Bodies. Several of the panels will have security features aimed at preventing teams from tampering with them. According to NASCAR Senior Director of Research and Development Brett Bodine, repairs to damaged cars should be easier with the composite bodies. The inspection process for cars using the composite bodies during the optional period will not change, and neither will the rules pertaining to in-race repairs, including prohibiting team from replacing body panels during races. While the composite bodies will be optional in the three aforementioned 2017 races and in 2018, those using them will have a competitive advantage in those races. One advantage will be less weight. Whether or not the bodies will be introduced in the Monster Energy NASCAR Cup Series is unknown.